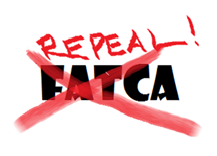 This Is an Urgent Campaign to Repeal FATCA ALERT! the so-called “Foreign Account Tax Compliance Act (FATCA). your state has one from each party, contact the Republican first! Unfortunately, the TTFI score was not included. Without JCT’s TTFI score, Sen. Heller’s two place-holder amendments cannot be moved to the Senate floor for debate and vote. Because Congress intends to pass tax reform using budget reconciliation (which imposes a limit on any increase in the budget deficit), no amendments without a JCT score can be included in the bill, and this, unfortunately, includes TTFI. Republicans Overseas is very disappointed that TTFI will not be included in the current Tax Cuts and Jobs Act. We will not stop fighting, however, and we still have a chance to make one major change in this bill process: repeal FATCA. Senator Rand Paul’s FATCA amendment has been submitted to the Senate, and the amendment will be debated and voted on as early as Friday. FATCA has already been scored by the JCT in a previous process, so it can be included in the bill. And I bet they both have no idea. Clearly both Prince Harry and Ms. Markle need advice. In your comments could you please give them your best wishes and a bit of advice. What should Prince Harry do? What should Meghan Markle do? What should the Royal Family do? The specific problem in the U.S. tax reform bills related to U.S. person-owned incorporated businesses in Canada, Australia, France, UK, etc. appears to have been identified. However, apart from the general solution of changing the bills’language to end U.S.-imposed worldwide taxation on individuals, WHAT IS THE ONE SENTENCE CHANGE IN WORDING OF THE TAX BILLS LANGUAGE THAT WOULD FIX THE PROBLEM IDENTIFIED IN THIS POST? This one sentence change could be sent to the drafters and supporters-antisupporters of the bills. IF YOU ARE INTERESTED, YOU CAN FORWARD OUR PRESS RELEASE WITH YOUR COMMENTS TO POLITICIANS AND OTHER ORGANIZATIONS IN U.S., CANADA, AND ELSEWHERE. Tricia has some thoughts that you might include (in a comment below). The Campaign to Repeal FATCA (www.RepealFATCAcom) was launched earlier this year with one purpose: to get rid of the Foreign Account Tax Compliance Act. FATCA is a textbook example of a badly conceived, badly written, and badly enforced law that doesn’t achieve its stated purpose but does inflict an excess of harmful consequences on citizens, American taxpayers around the world, the global financial and investment sectors, and the principle of national sovereignty. As Co-Leaders of the Campaign, we are writing to you on the supposition that in a democratic country elections should have consequences. When a political party stands before the electorate on declared principles and makes specific promises, those principles and promises should be reflected in how that party governs under its mandate from the voters. — Two different members of the tax compliance industry are now saying that the House/Senate tax bills are harmful to US persons overseas. Now a second Tax Consultant (Kevyn Nightingale) has come up with the same interpretation of the House/Senate tax bill: In part, a one-time transition tax will be imposed on US persons overseas owning small incorporated businesses. “Here’s my commentary on the Senate’s version of tax reform dated November 9, 2017. The United States is doing tax reform – a good idea for many reasons. The driver is the need to bring US corporate tax rates down, to make the country competitive with others. Also, they’re going to make the US corporate system “territorial”, meaning that most income earned by foreign subsidiaries will no longer be taxable. To make that change politically palatable, they’re also dropping personal taxes. But the cost of this is big – trillions of dollars. So legislators have to find some way to limit the revenue loss. They do that by increasing some other taxes. One thing they will do is apply an immediate tax (well, sort of immediate – it’s to be paid over 8 years) to the retained earnings of those foreign subsidiaries. And there’s some logic to this as well. Those earnings have been tax-deferred until now. If they fell into the “exempt” system in future years, US multinationals will have effectively gamed the system by keeping them offshore long enough to completely escape tax. Yes, Congress could have developed rules to tax those earnings as they were eventually repatriated, but that would have been arbitrary, complex, and invited even more gaming of the system. And immediate taxation generates revenue. So this solution is reasonable – in principle. One problem is that if you’re an American individual, and you own shares in a foreign corporation directly, this provision will create an immediate tax in your hands. You won’t get a foreign tax credit for the corporate tax (like a US domestic corporate parent). You won’t get a special deduction (like a US domestic corporate parent). You just have to pay tax on the retained earnings. If you live in a country where it’s common to run a small business through a corporation (say, Canada), you already have enough double-tax issues to worry about (Subpart F, filing forms 5471, FINCEN 114, etc.). This new provision will probably lead to double taxation. And even if you can pay out dividends to limit that, it probably will create extra tax in your country. The US tax probably isn’t creditable in your country (in Canada, it isn’t). Despite all promises and recent signs of hope, we “Americans overseas” (and those deemed to be such) have been ignored once again by the government that claims ultimate power over our lives. Now, and for the foreseeable future, we remain the only human beings on Earth who have an income tax imposed on them simply for who they are. We have been left out of the current tax reform plans developed by both legislative houses in spite of the huge efforts mounted collectively by those suffering under US tax oppression around the world. While I am grateful to those individuals in the US government who have recognized our plight and plan to continue to search for ways to introduce the world standard of Residence/Territorial-Based Taxation to the United States, I fear that the efforts are too little, too late. Except for the various lawsuits still pending (which could take years to resolve), domestic recourse has come to a crashing end. Our one remaining avenue of attack is in the international arena. We have waited long enough. It is beyond time for our plight to be recognized by the international community as the forerunner of an entirely new form of governmental abuse perpetrated by a combination of outdated law and 21st century cyber-surveillance. Human rights in the computer age extend well beyond the food, clothing, and shelter issues which the UN has traditionally championed. we would like to invite those who didn’t have an opportunity to sign the Complaint to do so. Those interested may make a request to read the Complaint by emailing calgaryfouroneone@gmail.com. You will be sent a link and a password. After reading the document, if you would like to have your name appended to it please let Calgary know. Your name will remain utterly confidential and will never be revealed to anyone in the United States government. ANYONE affected by US extra-territorial tax policies – citizens, renunciants, spouses, business associates — ANYONE who has or has had a stake in this issue — is welcome to sign! we need help from people in positions of power and/or influence who are sympathetic to our cause. Is anyone in contact with Sophie int’Veld, for example? There are several individuals in France such as Keith Redmond who have done a stunning job on behalf of this community. Do any of these folk know anyone who can lobby for us at the UN and get this process sped up? We desperately need this sort of help. we need ideas from all of you as to how to proceed and get our efforts publicized accurately while under the UN’s publication ban. Silence is no longer an option. If you think the UN is a waste of time, we need to hear that too! and a special request to those on Twitter and Facebook: please post links to this thread on any and all sites concerned with this issue. We need to reach everybody! Every year on the anniversary of the Complaint’s submission (August 7) we have sent a “Support Document” which details testimonials of harms suffered due to US tax policy and reported online over the previous 12 months. In 2017, with tax reform a very real possibility, we decided to wait until now to send this year’s document. It will be sent to the UN next week [postponed to mid-December to allow for a new round of efforts in Washington to prove successful or not]. It would be terrific to send them more signatures as well! This fight will be over when the United States of America abolishes CBT. Today (11/16/2017) the floor of the House passed the House tax reform bill. The earlier version is here . Do not yet have the final versions of either bill but suspect that we are not helped in the bills. Will post here final versions when they become available.